This is my Lennar Homes Tampa review on the ConsumerAffairs website. I’ve included links to other articles on this website to give you context. The Lennar construction defects in my home are so severe that I cannot even list the property for sale. “I bought a new construction home built by WCI by Lennar back in 2013. I currently have 80+ major construction defects – so severe that I cannot even list the home. To give perspective, I’ve lived in over 30 homes since I was born and haven’t experienced anywhere near the number – and severity – of the issues that I have in a new construction Lennar home. 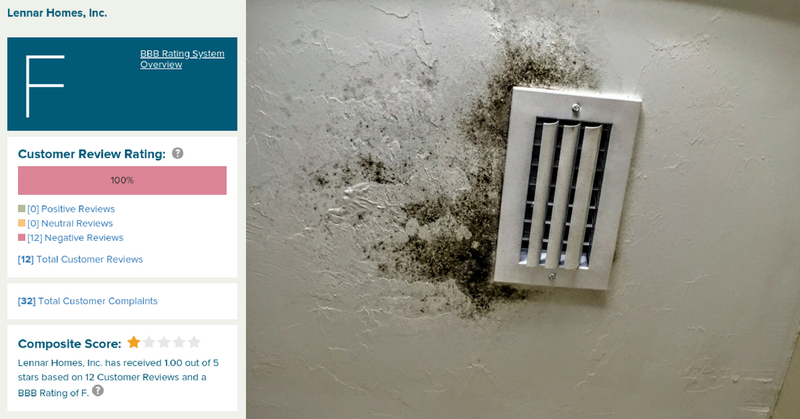 My neighbors experience much the same, including faulty A/C systems that have caused tens of thousands of dollars in flood damages, as well as extensive mold. Simply do a search for Lennar reviews and you’ll see the number of homeowners who have to deal with A/C systems and mold. It’s a consistent pattern with Lennar. I’ve experienced 25 A/C malfunctions in 4.5 years. The A/C is just one of the dozens of issues in my Lennar home. The issues involve electrical issues, HVAC problems, mold exposure, structural defects, water intrusion/damage, metal corrosion and environmental concerns. These construction problems, in addition to dealing with the stress of it all for more than 4.5 years, have led to health issues. As well, other people get sick when staying at my Lennar home and exhibit similar symptoms. Between improperly installed and defective A/C units and faulty roof flashing during construction, the house has extensive water damage and mold, which has impacted my health and the health of those who have spent any significant time here in the home. What’s worse? Lennar knows about this. I worked with the Lennar Division President (Mark Metheny) and his team through multiple inspections and meetings to go through the 80+ defects. RELATED: Dripping Water Sound in Bathroom Vents - A/C Issues? They were at the point of more inspections and bringing in an environmental company when they simply stopped responding, even though they said they would make the repairs. Even if the repairs were made and because of seller disclosure laws in the state of Florida, I would have to list it well below market price and it would likely need to be a cash buyer. That’s how bad it is and that’s not my fault. There is nothing that Lennar could do at this point to ‘make me happy.’ The only thing they could do is do what’s right. I’m not sure how these people even sleep at night. One thing to know – buying new construction is not like buying a new car. You have virtually zero consumer protections in buying a new construction home and the Lennar home warranty is horrible. I wish I had done more research on this before I signed the contract. There are no ‘lemon laws’ and you’ll be responsible for any attorney fees to get the home you wanted. You can expect to pay a minimum of $50K-$100K to simply get the repairs done – you won’t be able to ask for any lost work time, medical or any other damages other than simply getting the home that you were promised. I’m confident if enough people start speaking up about Lennar, that they will have no choice but to change their approach. This shouldn’t be allowed to happen and it will continue until consumers stop spending with them and lawmakers build consumer protections for new construction homes. If things go wrong? You’ll have a much easier time getting it resolved through insurance or taking action against the previous owner for non-disclosure of defects. If I had to do it all over again, that’s what I would do.